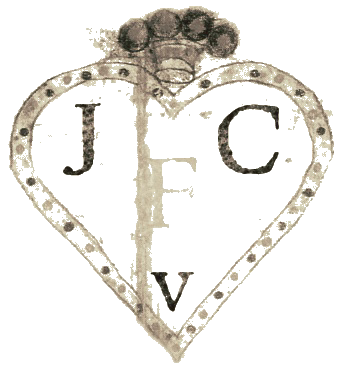 Tradition has it that the Virgin Mary appeared to San Magno (St Magnus) Bishop of Oderzo, in the form of a buxom (formosa in Italian) woman and told him to build her a church under a white cloud. And so this, the first church in Venice dedicated to the Virgin Mary, was built, some time in the 7th century by the Tribuno family. The first certain documentation concerns rebuilding in 1060, and there were one or two more rebuildings before the current church was built by Mauro Codussi in 1492. He kept to the dimensions of the foundations of the earlier church which was by then almost in ruins. The church was visited by the doge and a procession of twelve young girls every 2nd of February. This procession of 'Marias' was to commemorate the rescue of the brides abducted by pirates from Istria and Trieste from San Pietro di Castello some time in 944. 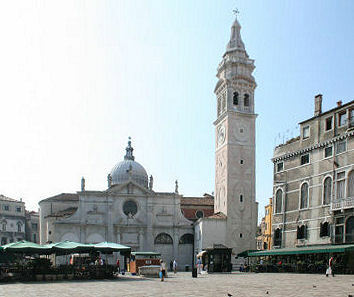 Santa Maria Formosa being the centre for the guild of casselleri (casemakers) who carried out the rescue and requested an annual visit from the doge as reward. This was also the church of the scuole of fruit-sellers and gunners. The current church was planned by Codussi but the exterior was completed after his death in 1504 by unknown hands. The cupola was probably added by Codussi's son Domenico, following his father's design. The façade onto the rio was erected in 1542 and commemorates Vincenzo Cappello, a sea captain who was victorious against the Turks. The façade onto the campo (maybe by Smeraldi) was completed in 1604 and contains portraits of other members of the Cappello family. These façades were paid for by, well, the Cappello family. They were restored by Venice in Peril in the mid-1990s. The interior was renovated by merchant Torrino Tononi in 1689. The dome was repaired in 1688 after an earthquake that year, and in 1921 following a hit during Austrian bombing in 1916. Codussi's centralised interior kept the existing Greek cross plan. It's initially a confusing and asymmetrical-seeming space, the nave is just about longer than the apse, the two pairs of deep nave chapels have pairs of arched windows between and to the crossing. The first chapel on the right has the highlight Vivarini, the highlight Palma is the far right chapel in the crossing. 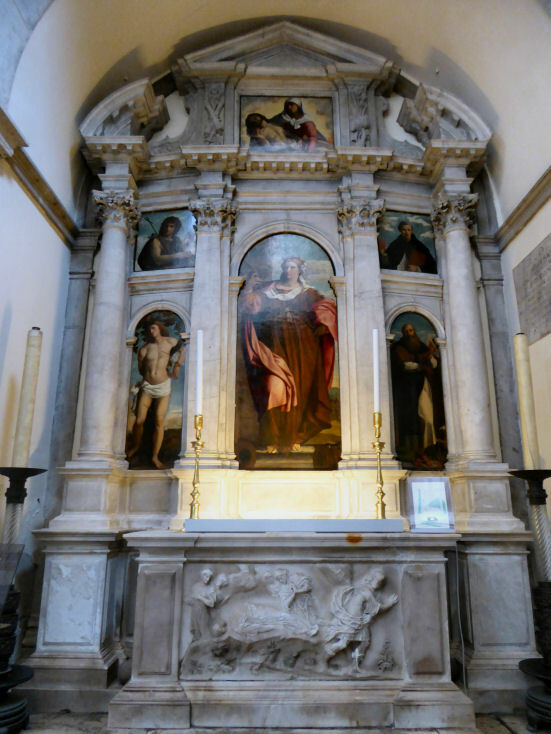 There's a free standing arched high altar with an altarpiece on the curved wall behind by Giovanni Segala depicting The Presentation to the Doge of the Brides Kidnapped by Narentine Pirates. One enters through the main door now, and behind the Chorus desk there's the small tondo of The Circumsision of Christ by Catena, a Venetian artist we're always happy to see something by, his works being rare, although this one is labelled attrib. This is quickly followed by a highlight triptych by Bartolomeo Vivarini (see below right). The central panel of the Madonna della Misericordia is flanked on the left by a painting of her parents, Anne and Joachim, who are about to embrace and kiss, this being how she was conceived. This triptych has lost its original gilded Gothic frame, and seems a bit small the later marble frame it now inhabits. Then there's the Santa Barbara polyptych by Palma Vecchio (see right) , and a fine and forceful looking woman he makes her too, in this his Giorgione-inspired masterpiece. (She is said to be a portrait of his daughter Violante, beloved of Titian, but Palma never seems to have been married.) She sits on an altar dedicated to the scuola of the bombardieri (artillerymen) for whom she is the patron saint. This scuola played a prominent part in public processions, not because of its influence or relics, but because of its spectacular uniforms. Vasari thought her one of Palma's best works. 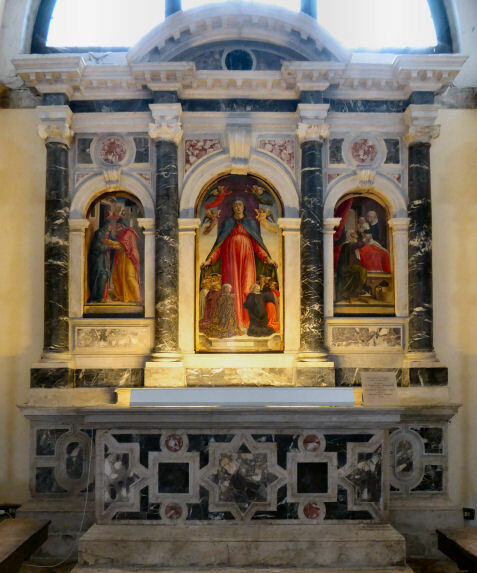 It is claimed to be the last great polyptych commissioned for a Venetian church, as the form was by then falling out of fashion. The marble framing is 18th century. On the altar below is a carved relief showing her lying on the ground with her head unattached, because she's just been decapitated by her father. De Barbari's map shows a squat brick tower with a sugar-loaf spire surrounded by four pinnacles. This was replaced with the current campanile, designed by Francesco Zucconi, a priest, in 1678-88. On the arch at the base of the campanile is a grotesque mascherone - a carved head said to dispel evil spirits (see below right) - which was much loathed by a somewhat squeamish Ruskin. Leering in bestial degradation he said, too foul to be either pictured or described, or to be beheld for more than an instant. He then, in prose somewhat spittle-flecked even for him, goes on to claim that these faces, characteristic of the later years of the Republic, symbolised the evil spirit that lead to Venice's final decline. It seems odd to me that a man who repeatedly argues the supremacy of the 'authentic' gothic over the 'debased' renaissance style should be so set against such grotesques. He then argues that there's a difference between true and false grotesque. Oh, and he prudishly translated the word formosa as beautiful. Also the carved head is said to actually represent someone suffering from fibromatosis or von Recklinghausen's disease. The Campo Santa Maria Formosa by Canaletto in 1733-4. Reproduced by Bellotto around 1742. Also an oil painting by Sickert and an etching by one D.S. MacLaughlan (see far right). 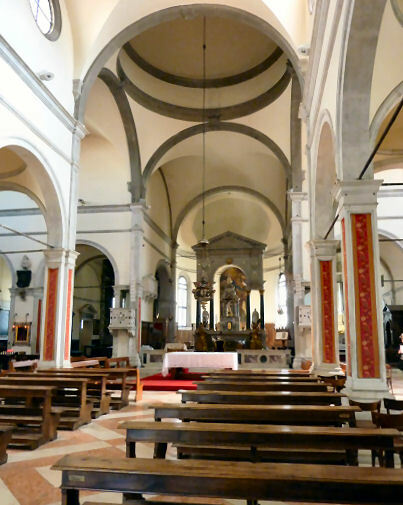 Santa Maria Formosa plays an important, if not picturesquely evoked, part in Muriel Spark's novel Territorial Rights. The adjective frequently used in the book to describe the church is 'bulbous'.